We’ve been doing a lot of trying things out lately, and not a lot of actually getting much done. But sometimes that’s ok, if only to satisfy your own curiosity. 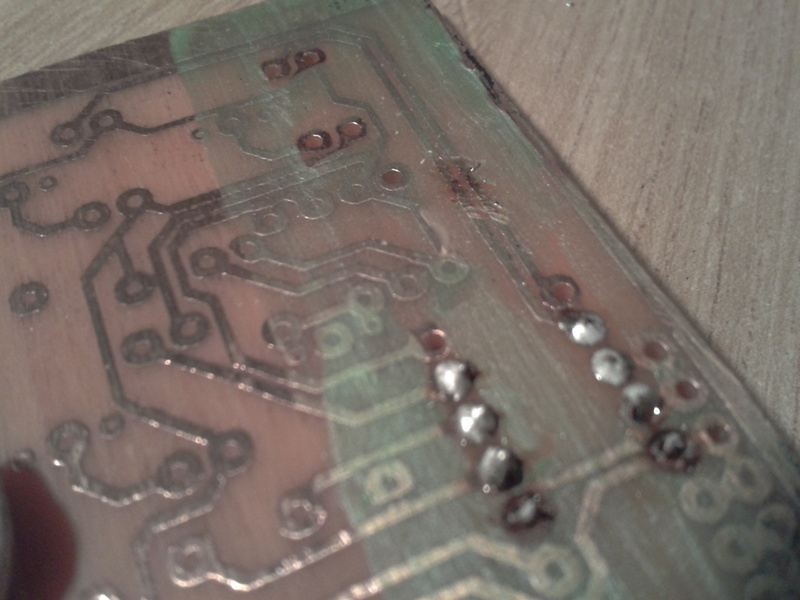 One thing that’s been bugging me is how close we got to making some really useful pcbs with the laser cutter (cutting the etch resist from Halfords Car Paint applied to the copper board) and that it was the soldering, rather than the making of the pcb, that failed. So what if we had some cheap form of solder resist – would the pcb have worked then? 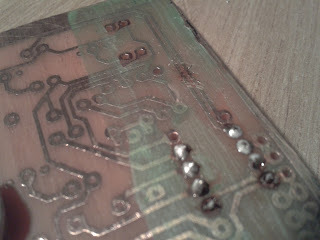 I couldn’t get the idea out of my head that an enamel paint should not only stop the solder from sticking to the copper board, but should also be pretty heat-resistant too. And the cheapest source of enamel paint…? There’s a peculiar fancy-dress shop on George Street, in Hove, filled with all kinds of outfits and make up and wigs, false eyelashes and nail varnish that’s frequented by some rather burly looking fellas. Taking a lead from a strapping six-footer with a deep voice (who called the shop assistant by name, so it obviously wasn’t his first visit) I wandered in and checked out the nail varnish. I’m sure the shop assistant thought I was looking for something that wouldn’t clash with my eyes, but in all honesty I just wanted a matt, plain paint with no glitter or metallic flecks in it. And it had to be enamel, not acrylic. I was quite particular about that, which reinforced the shop assistant’s view that I knew more about ladies nail varnish than I cared to admit to. Just £1 later and I was the proud owner of some lime green, plain opaque nail varnish. It didn’t paint onto the board very well, using the brush supplied in the top of the bottle, but well enough for a proof-of-concept attempt. I deliberately painted over some of the holes I intended to solder, and sloshed it around over some tracks on an old pcb that had no use. The idea is to test for continuity across the tracks that have been painted over and hopefully will still return negative (which is why the nail varnish had to have no metallic flecks or glitter effect in it). Then I’ll try soldering onto a painted area. 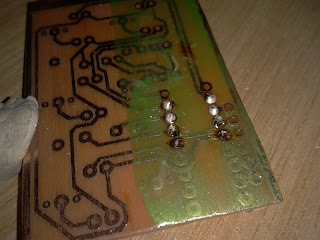 As you can see from the photo above, the solder took to the pcb where the pads were still exposed, but the last pair of pads appear scorched. This is because the solder refused to stick – it kept rolling up into a ball and coming away from the board as I lifted the soldering iron. Also there’s a patch where the two tracks run side by side which appears scorched too. This is where I tried to apply some solder to create a deliberate bridge between the two tracks. Once again the solder just balled together and fell off the board with a slight tap. So all in all, it was a successful test. Our conclusion? If you get non-metallic, enamel nail varnish, and paint it over your pcb, leaving only the required pads exposed, it does indeed act like a cheap solder mask.